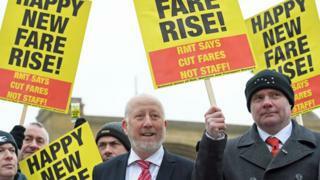 The shadow transport secretary says he was forced to cancel an event as part of protests against rail fare increases - after his train broke down. Andy McDonald was due to speak in Leeds but his train from London King's Cross stopped near Grantham due to a fault. Average rail ticket prices have risen by 3.4% across the UK, with many commuters paying more than £100. Mr McDonald said: "If anything ever demonstrated just how broken this system is its this today." Why are train fares going up? The Labour politician had been at a similar protest event outside King's Cross station, one of a number taking place across the country. In a video posted on Twitter Mr McDonald said: "My day of campaigning for a publicly-owned railway has been interrupted today because of the breakdown of this Virgin Train as I head to Leeds - it's run out of power, a little bit like the Tories." A spokesman for the Department for Transport said it was investing in the "biggest modernisation of our railways since the Victorian times". He added that regulated fares - which comprise about half of all tickets - have been capped in line with inflation for the past five years.